Complete your DEFENDER security system with an ultra-compact 24” LED Monitor. The included VGA and HDMI to DVI cable connects to your DVR so you can easily view live or recorded footage on the super slim screen. Choose to mount this monitor on the wall (VESA mount compatible) or opt for tabletop use with the included stand. Crisp, clear footage from your DEFENDER system is displayed in stunning high resolution for a complete and convenient security solution for your home or business. 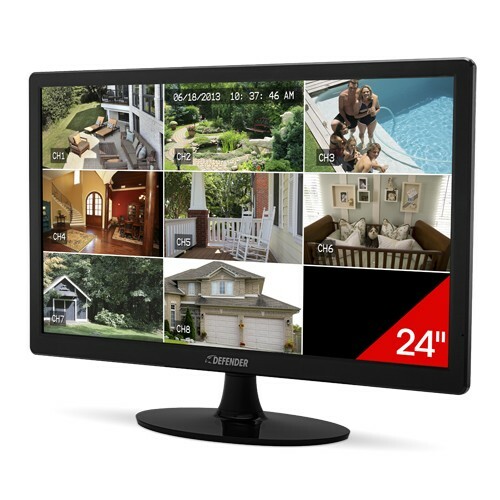 Complete your security system with this 24” LED Monitor. It’s the perfect addition for a total monitoring solution. An ultra-slim LED profile fits virtually everywhere on an attractive stand. This lightweight monitor is also compatible with VESA wall mounts. Do justice to the sharp and clear resolution of your DEFENDER cameras and view footage in 1920 x 1080 resolution. Add this monitor to your DEFENDER system in a single step by directly connecting to your DVR with the included VGA and HDMI to DVI cables.